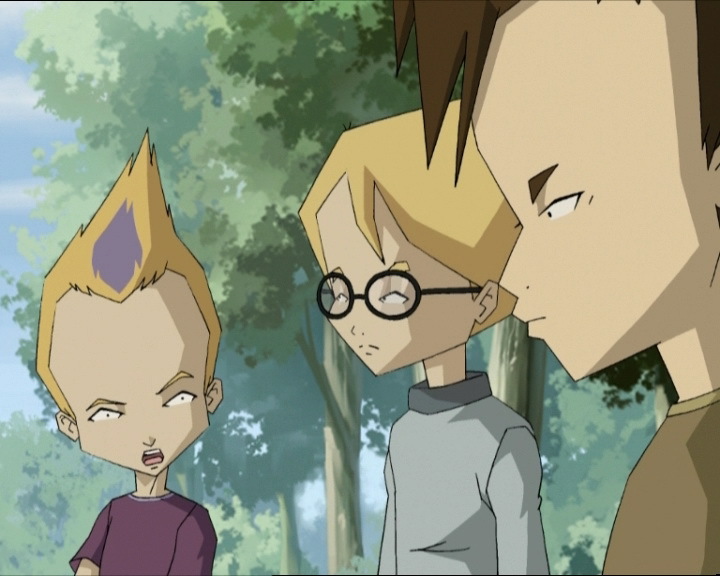 During a routine mission, Odd takes the initiative of sneaking Kiwi onto Lyoko with him, against Jeremy’s wishes. 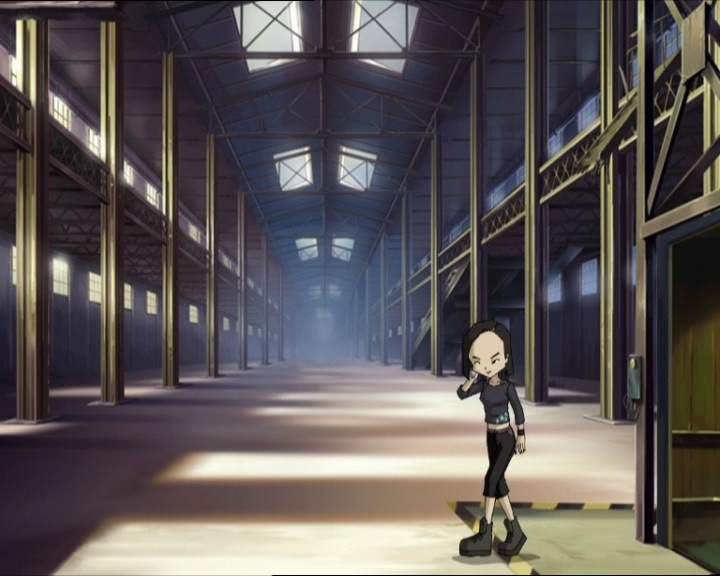 Unfortunately, things do not go at all the way he had imagined… While the Lyoko Warriors struggle to deal with the resulting problems, Xana attacks by possessing a motorcycle gang who take over the factory. Meanwhile, Yumi tries to allay Sissi’s suspicions, as the Headmaster’s daughter finds more and more that William (in reality, his body double) is behaving quite strangely. PE class with track practice on the menu, the boys of the group are getting ready in the locker room. Odd had forgotten his socks but his faithful canine brought them to him in his mouth, and Odd praises him. Arriving on the sport field, they find Yumi about to race, and mock Sissi on the way there, as is the daily routine! Ulrich, lately even closer to his Japanese beloved, encourages her in her race, and she smiles. William’s clone once again displays its chronic stupidity to Jim! He doesn’t start running like the others when Jim says go…and Sissi decides to poke her nose into it. If she realises that something happened to William and tells her father, our heroes could be in for some serious problems. Yumi saves the day this time, telling Sissi that she and William are in love! Sissi is shocked at the news, and Jim luckily interrupts the mess by sending the year 10 students away, their class ended. In the cafeteria, the subject of conversation at our heroes’ table is evidently the stupidity of William’s clone. Jeremy maintains that they need to make do with this clone because a new clone would be too much work, and it’s not Jeremy’s top priority. He proposes Yumi continue pretending go out with William to fool Sissi, which she doesn’t like the sound of at all! Ulrich doesn’t either. Everyone then agrees that Yumi continue with this plan, everyone except her. 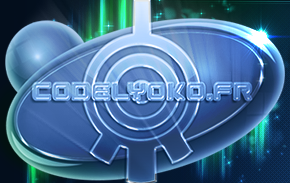 Odd wants to take his dog to Lyoko! He enthusiastically praises his dog’s qualities as a scout, which would be multiplied in the virtual world, but Jeremy doesn’t agree at all. Jeremy teases Kiwi, and Odd reminds him about his own pitiful experience as a Lyoko Warrior! 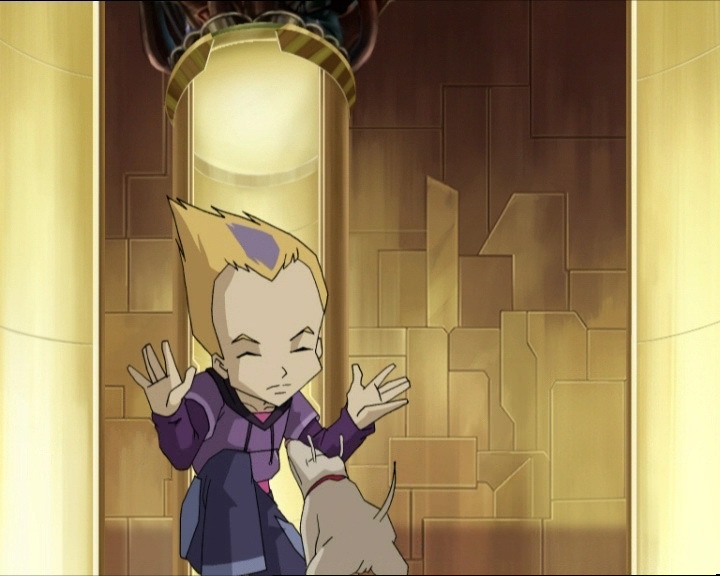 Jeremy, Aelita and Odd head for the factory, direction Lyoko, to install Jeremy’s program in a tower in the Desert. Despite Jeremy’s refusal, Odd brought his dog with him, hidden in his backpack! At that same moment, Sissi is up to no good: she’s decided to know more about William’s condition, so she goes into his room. William’s clone doesn’t know how to respond to Sissi’s interrogations: is its love story with Yumi real? In any case, when he says that Ulrich is a nice guy, while Ulrich is William’s rival, Sissi becomes even more suspicious; something is going on at Kadic. And Sissi wants to alert her father, the principal! Luckily Yumi arrives in the room just in time, pretends to be in love with William and takes him far away from Sissi! 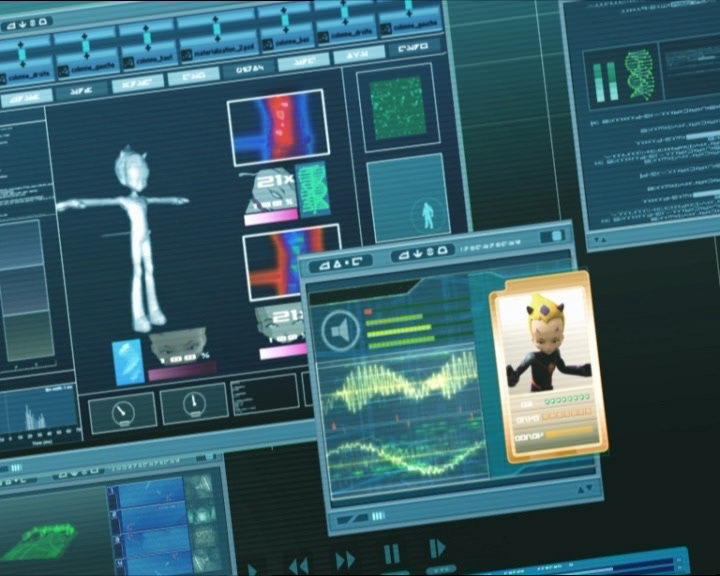 In the lab, Jeremy sends Aelita to Lyoko, escorted by Odd. While getting into the scanners, Odd behaves strangely… Once Aelita’s scanner closes, he takes his dog out of his bag and takes him into the scanner with him! His plan is to be virtualised onto Lyoko with his faithful dog, even without Jeremy’s permission. Jeremy doesn’t really know what game Odd is playing, but launches the transfer anyway: they’re off to the Desert Sector! Virtualised, Odd waits to see his dog arrive like he did, but strangely, nothing happens. Aelita goes to the tower to install Jeremy’s program, and Odd stands guard outside. Odd is worried about his dog, he was expecting to see him virtualised onto Lyoko! In town, Yumi and William try to escape Sissi’s watchful eye, chasing them to find out more. On Lyoko, Odd’s hearing seems to have become much more accurate: he hears noises and alerts Jeremy. He confirms it, Tarantulas are approaching, but they’re at the other side of the Sector! It’s incredible that Odd managed to hear them… Jeremy sends Odd his Overboard just in case. Odd jumps on, but finds it hard to keep his balance… He can’t stand upright, and quickly loses control of the vehicle! He ends up falling and trying to slow his descent by digging his claws into a rock, but lets go partway down, rolling to the bottom. Jeremy takes it as childish antics, and doesn’t appreciate that his friend’s games distracted him from the mission: protect and guard the tower Aelita is in. 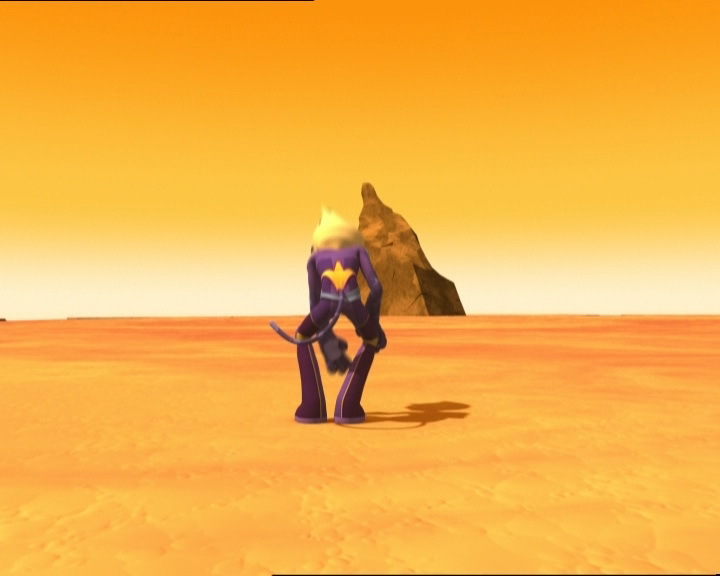 Aelita finishes activating the program in the tower and returns to the Desert plateau, unable to see Odd. Jeremy rattles on about Odd clowning around and brings the two back in, the mission over. Scanners open, Odd is in a panic: his dog isn’t there, he didn’t come back in the scanner! When getting out of the scanner he falls to the ground, apparently having trouble walking on two feet! The dark-haired lovers are still being followed by Sissi, tenacious and determined to get to the bottom of what the group did to William! 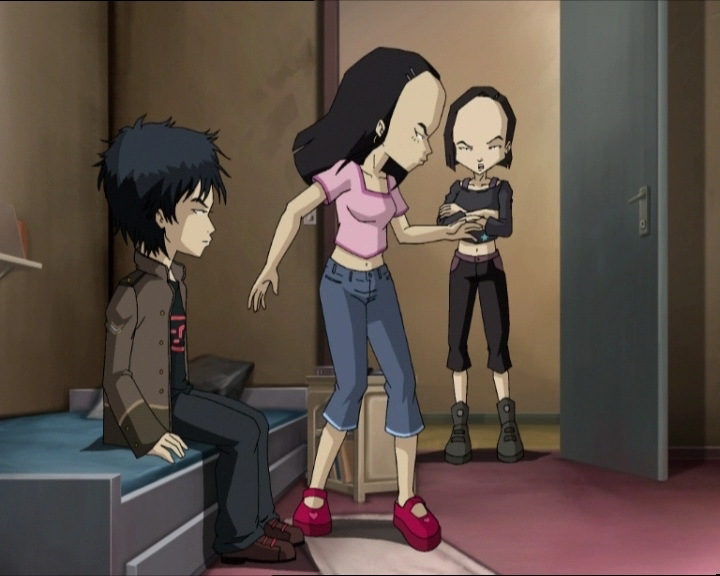 Jeremy, Aelita and Odd returned from the lab, Yumi calls them to get her out of the situation: Sissi hasn’t left them alone all afternoon and has been chasing them through the town… Yumi really needs to return home, so Jeremy tells her to bring William to the school and they’ll look after the clone. At the same moment, Yumi enters Kadic’s grounds, bringing William with her…but Aelita calls to tell her about the problem with Odd, telling Yumi she’ll need to stay with her handsome partner a little longer. Jeremy explains everything to Yumi: according to the data from the last scan, Odd absorbed Kiwi during virtualisation. His human metabolism is still dominant but it won’t remain like that for long! Jeremy and Aelita think they can bring Odd back to Lyoko and use the scanners to separate them again. As soon as Jeremy figures out how to get rid of Sissi, he’ll call Yumi, and free her from William’s company. The group returns to the lab, and Odd is acting more and more like Kiwi! He now runs on four “paws,” which amuses his friends. Leaving the sewers, they find another big worry: bikers. They’re squatting in the factory and standing at the entrance looking hostile… Jeremy tries a more intellectual approach, but it doesn’t work. Ulrich then tries to make things physical. Odd then bounds over like an animal and growls at the bikers, clearing a way through for the others with a diversion! They rush to the lift, Jeremy takes his place in the lab and the others hurry to the scanners. Jeremy explains the procedure to Odd: virtualisation onto Lyoko, then reconstruction of their individual DNA sequences, which should return them to their original molecular state. Arriving in the Mountain Sector, Odd moves around like a real doggie! Jeremy warns him: devirtualisation before the end of the separation process will land Odd in the doghouse for good! But as Jeremy begins work on Odd, the Superscan goes off: a tower has turned red in the Ice Sector…Ulrich and Aelita go to take care of it. Arriving on site, they’re entitled to a choice of welcoming committee, from a menu of the attack of the day: three Tarantulas ridden by the dark knight, aka William! Jeremy sends them the Overbike, and Ulrich takes the wheel. On his end, Odd is attacked by three Bloks, and needs to escape at all costs. With Yumi, it’s still the same problem. She’s stuck with William’s clone and Sissi is still spying on them. Jeremy once again saves the day with his voice synthesiser. He calls Sissi using Mr Delmas’ voice and tells her to come back to Kadic to do her homework! Free of Sissi, Yumi leaves William to his own devices and runs to the factory. On Lyoko, the fight begins. William orders the Tarantulas to open fire. 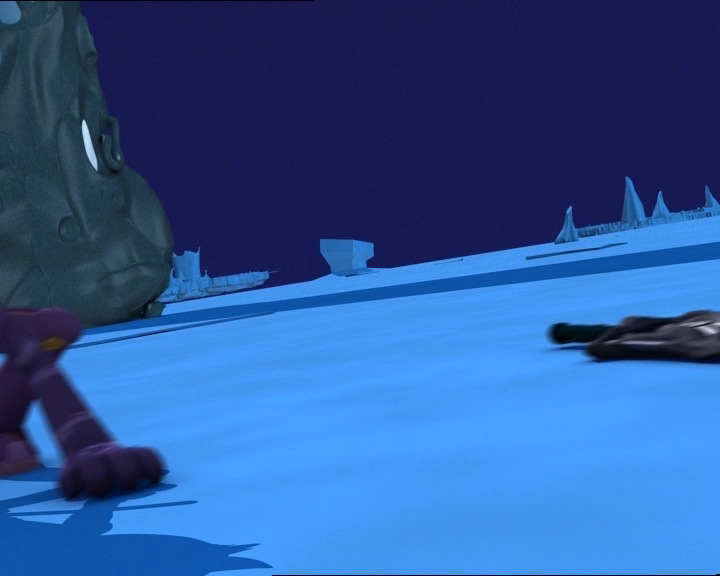 Ulrich rushes towards William, dodging the laser fire, but Aelita is hit by one and falls from the vehicle. Ulrich continues his drive towards the monsters and attacks one of them. He speeds towards it, leaps from the Overbike and stabs its eye with his sabre in mid-jump; the Tarantula explodes, Ulrich falls back right on the saddle of his vehicle. In the Mountains, Odd doesn’t have time to enjoy the fresh air! Three Bloks on his tail, avoiding devirtualisation, he needs to do everything he can to avoid returning to the scanner before Jeremy gives the green light… Odd is hiding behind a large rock, but a sudden bark – canine impulse – gives his position away! He then tries to shoot the Bloks but keeps missing, and ends up running again! Yumi arrives at the factory lift, but it’s locked. She telephones Jeremy who tells her why he did it and asks if the bikers are still there. Apparently Yumi didn’t run into them, only now…Yumi discovers that XANA’s attack is to possess the three bikers! Ulrich is still fighting on Lyoko. He knocks a Tarantula to the ground by ramming it with his vehicle and pierces its thorax with a sabre. Ulrich jumps from the monster before it explodes, then chases after William, who is pursuing Aelita on the back of a Tarantula! Back in the Mountains, Odd tries to shoot a Blok while running, and is hit by a laser! His arrow rebounds off a rock, then a tree, then finally makes it into the eye of one of the Bloks! But Odd has lost too many life points, one more shot and it’ll all be over, he’ll be Kiwodd forever if he’s devirtualised… Odd runs on all fours and hides behind another rock, still under constant fire from two Bloks. Odd is still being chased, and finds himself face-to-face with the Bloks. He jumps onto one of them, but the Blok starts to spin, spin, spin…getting dizzy fast, Odd jumps onto the other one. It does the same thing, so Odd abandons the idea and jumps from the Blok’s head, starting to run again. 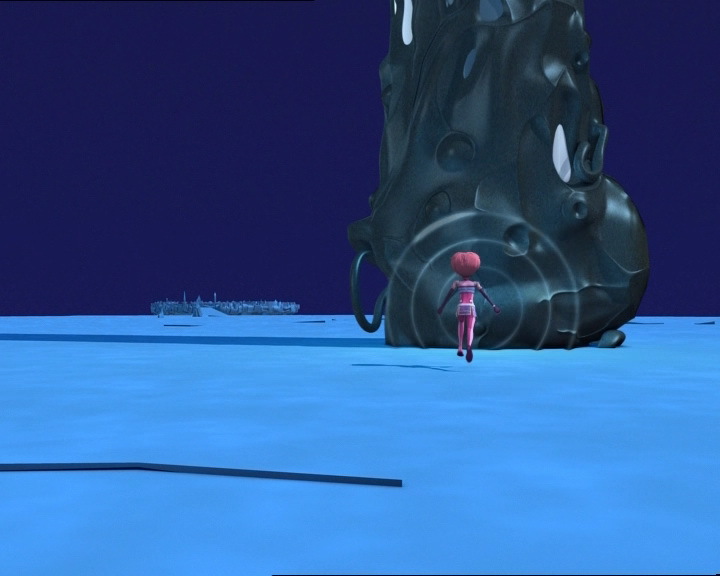 Aelita runs with William on her heels, but she quickly arrives at the edge of the Sector: Aelita is cornered with William on one side and the Digital Sea on the other! She gains time by throwing energy fields at William, but it’s not the best thing to do… Ulrich takes William by surprise and sends his Overbike into the final Tarantula. William turns into Supersmoke and reappears behind Ulrich. Aelita tries to warn him, but it’s too late: William gets rid of him with one hit to the torso, Ulrich is devirtualised. Yumi isn’t responding to Jeremy’s calls anymore (so he sends Ulrich to help), she’s in a really bad spot: three bikers right behind her, and she can’t stop running… She ends up in the assembly part of the factory. Yumi lays a trap for two of the bikers on their bikes: she holds a rope taut and drags them off their vehicles. The third attacks Yumi with an electric field! Being very agile, she dodges, jumps onto the biker and escapes via the upper staircase in the room. The biker gets up again and hits her in the back with an electric charge. Jeremy tells Odd that his work is done: he just has to devirtualise himself! So Odd stops, at the mercy of the Bloks, but Jeremy realises that he forgot something crucial! He yells at Odd to get out of there! Odd defends himself with his shield, sending the Bloks’ lasers back at them, destroying them. Jeremy didn’t erase the DNA from the scanners’ memory, so it wouldn’t have worked. Jeremy works on fixing it, and Odd decides to defy the brainiac and run to the Way Tower, off to the Ice Sector to help Aelita! Yumi walks slowly, weakened by the lightning shot by the biker, towards a room she can hide in. She makes it inside just in time, the bikers have found her and try to force the door down! Ulrich runs to find and help Yumi. Odd arrives in the Ice Sector. He uses his canine hearing to listen for the sounds of the fight and find Aelita! The three bikers have gotten into the room and attack Yumi. She hides behind a pillar. The bikers become more and more dangerous and Yumi is in big trouble, they throw huge bolts of lightning at her. 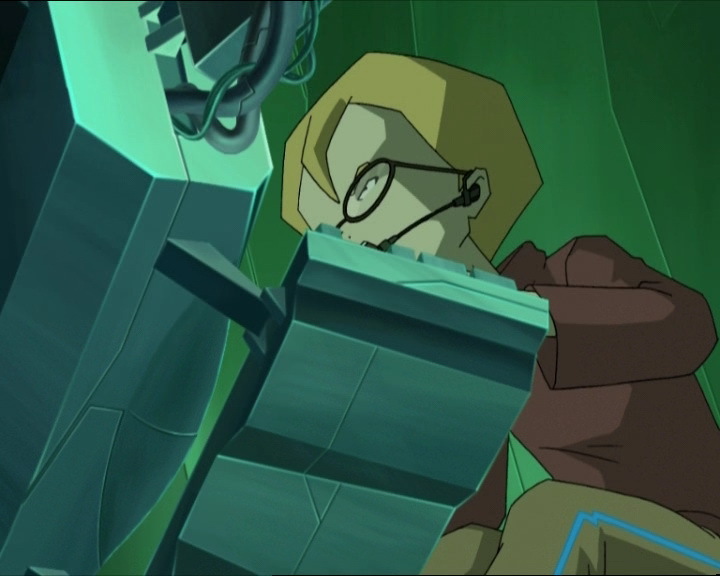 On Lyoko, William approaches the edge of the platform to look into the Digital Sea, but surprise! 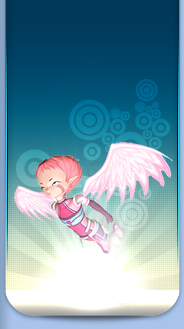 Aelita deployed her wings just in time and is on her way to the activated tower. William uses her Supersmoke and gets between her and the tower. But Odd appears and jumps on William, letting Aelita get through! Odd’s risk is great because the process isn’t done yet. William gets his sword back with his black smoke. Odd leaps towards him, and William devirtualises him… Too late! The reconstruction is complete, Odd and Kiwi are back in the scanners, and Aelita has entered the tower! Yumi is no longer at the mercy of the bikers, who had lifted her from the ground in an electric field. Yumi resisted for long enough: the tower is deactivated, the bikers are normal again and Yumi is saved! Ulrich runs to her aid. Now, our Lyoko Warriors must place the bikers at the factory entrance before they come to. Back on the factory bridge, the bikers wake up and find themselves confronted with a terrible threat: a furious Kiwi! Seeing the white froth in the dog’s mouth, the three bikers escape very quickly! Odd’s idea: an angry dog foaming at the mouth with toothpaste… That solves the problem of squatters at the factory! The next morning at Kadic, Odd brings up his idea of virtualising his dog again, and Sissi comes back to see the group. She accuses Yumi of being the cause of William’s strange behaviour, to which Yumi responds that she’s broken up with him, so it’s normal that he’s acting strangely! On this note, the group leaves with Yumi, leaving Sissi silly with rage, determined to get to the bottom of it all! And of course, Odd remains a stomach on legs, be it two, or four! - In this episode, William uses his zweihander to send Aelita's energy fields back at her. - First time Odd's shield deflects laser fire from monsters. - First time Bloks spin themselves around to throw a hero off. - Second time William rides a Tarantula. - William's clone thinks Ulrich is very nice. - Odd has a photo of Kiwi taped to the inside of his gym locker, he likes broccoli and always goes out with a tube of toothpaste. - Sissi's headband is black instead of yellow in one shot. - The door to Ulrich and Odd's room often changes colour. - The yellow button on the lift changes place when Yumi exits it and it disappears when Ulrich exits. - In the cafeteria, the contents of Jeremy's plate changes at the moment when Yumi thinks Sissi will talk to her father about William's clone. - The heart on one of Sissi's hairclips disappears when she asks if Yumi is responsible for William's strange behaviour, and the marks under her eyes disappear when she says that she wants to tell her father about William. - When Jeremy, Odd and Aelita arrive at the factory, the bikers had left a mess: tire tracks, empty cans…but when Yumi arrives at the factory sometime later, she finds it back in order. The tire tracks reappear when one of the bikers notices Yumi. - When Yumi is hiding behind a pillar and brings her arm up to shield her face, her shirt sleeve is shorter than normal. - Fourth appearance of Jeremy's voice modification program. He uses it to call Sissi using the principal's voice. - Second time a Tarantula doesn't explode after being hit with the Overbike. 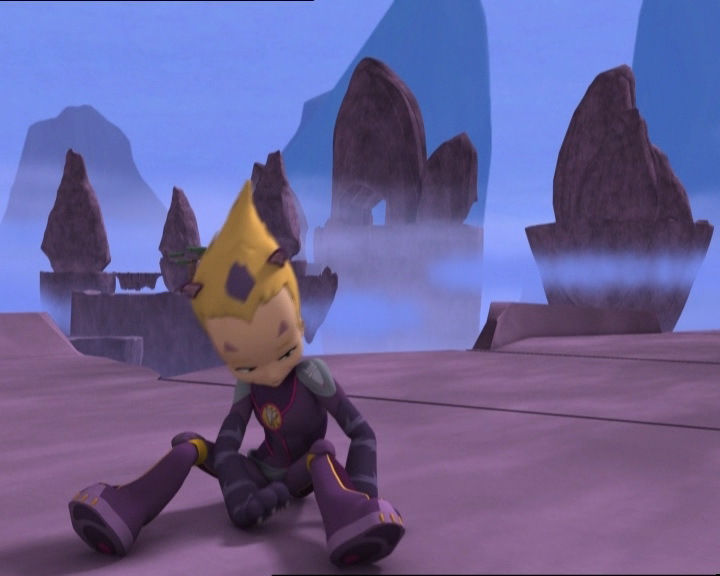 Ulrich alludes to episode 57 “Aelita” when Odd suffered from severe plantar perspiration. - Allusion to episode 31 “Mister Puck” in which Jeremy was virtualised and peisode 47 “Tip-top Shape” when Yumi came first in a sprint. Kung-fu is the Western name for Chinese boxing. - Dog Day Afternoon is a crime drama film directed by Sidney Lumet that was released in 1975. Its title in turn refers to the dog days of summer, which are the warmest days in summer. Ulrich (impatient): Odd, hurry up. Jeremy: You’re not wearing socks to get a better feel for the track? Odd: No, I forgot to put them on. Boy am I going to have blisters! Ulrich: The way you sweat, you’ll probably have to chuck your sneakers! Ulrich: He followed the smell of your feet, easy! Odd: Hahaha, very funny! Your jokes stink worse than my feet! Jim: On your marks, get set, go! Jim: Very good time! Huh? Dunbar! When I say “go” it means go! Two-letter words aren’t that hard, are they?! Either his ears need washing or he’s totally out of it…! Sissi: You look completely lost, William. How come? Clone William: I’m not lost. We’re at the track, right? Sissi: Just a complete halfwit, right?! Yumi: That was a close call with Sissi today. Aelita: I don’t think she bought the love story between you and William. Ulrich: Can’t we upgrade the quality of William’s clone? Jeremy: Sorry, like I said, his stupidity is an unforeseen emerging factor beyond our control. To fix it I’d have to reprogram everything, we’re just gonna have to keep improvising! Yumi: If we can! Sissi’s getting very suspicious. Think of what’ll happen if she tells her father about William! Jeremy: Well then, in that case, the only solution I can see is…to keep pretending you’re in love! Aelita: Perfect, if you’re always hanging out together, then no-one can get near him! Odd: You’ve got a very vital mission, you’ve gotta keep our secret safe! Jeremy: Anyway, I did improve the security program for the tower that runs William’s clone. Aelita, how would you like to go to Lyoko to install it after class? Aelita: No problem! Who’s going with me? Ulrich: Do all of us have to go? Jeremy: Just one of you will be enough to keep an eye on things with Aelita. Odd: I volunteer! And I also happen to have a fantastic idea! Odd: Why don’t we take Kiwi to Lyoko this time? Jeremy: Your brainless dog? But what for? Odd: Oh, first of all, my dog is not brainless. 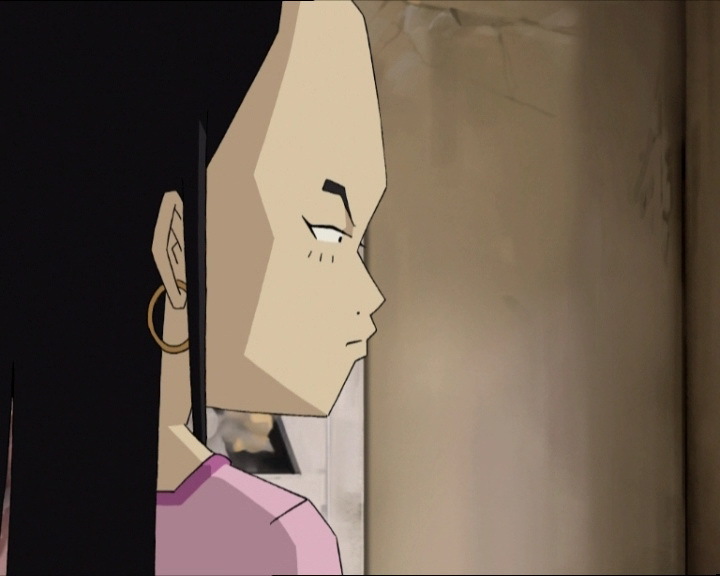 Secondly, our natural talents are multiplied on Lyoko. Imagine Kiwi and his sense of smell, he could sniff out monsters from miles away, and he might even be able to sniff out William on the network! Jeremy: No way, Odd! Besides, Kiwi’s such a coward he’d take off the second he saw a Kankrelat! Odd: Oh yeah? As fast as you did the time you went to Lyoko? Jeremy (seeing the cans and tyre tracks): What happened in here? Odd: Looks like some bikers used our factory for training! Aelita: Anyway, they don’t seem to be here anymore. Jeremy: Odd, is that you making that racket? Odd: Uh yeah…my tummy’s rumbling. Would you believe it? I’m still hungry! Jeremy: Don’t worry, this won’t take very long. Odd: Once you’re on Lyoko, you’re gonna be a big star! Clone William: Where are we going? Yumi: Never mind, just keep running! Odd: Jeremy, I hear some kind of noise! Jeremy: Hang on…you’re right, two Tarantulas just appeared. For now they’re at the other end of the Sector. I’m sending you the Overboard just in case! Jeremy (annoyed): Knock it off, Odd! The Tarantulas are far away, but still! Odd: I can’t seem to keep my balance, what’s wrong with me?! Aelita: Ok Jeremy, the program’s operational. But where did Odd go? Jeremy: He’s busy clowning around somewhere! Aelita: No biggie, Jeremy. Odd just missed his snack time, and it doesn’t seem to agree with him! Yumi: I’m with William and I can’t get rid of Sissi! And I’ve got to go home right now! Jeremy: Just bring him back to school and we’ll take over. Yumi: Ok. Come on, Romeo, we’re going home. Clone William: Is Romeo a nice guy too? I don’t think I know him. Yumi: Let’s go, I’ll explain on the way! Aelita: Except that Odd’s acting really weird! Ulrich: You mean you only just noticed? Ulrich (disgusted): Odd, I know you’ll eat anything when you’re hungry, but that’s ridiculous! Jeremy: Ugh! Come on, Odd! Get real! What’s wrong with you? Aelita (covering her eyes): Gyah! Jeremy (hiding behind his laptop): Cut that out! Aelita: Yumi, you’ve gotta hang out with William’s clone a little longer. We’ve got…a slight problem! Here’s Jeremy. Talk to Yumi. Jeremy: Listen Yumi, according to my diagnosis, Odd absorbed Kiwi during virtualisation! Yumi: Is it serious, doctor? Jeremy: Pretty much. Right now, his human metabolism is still dominant, but if we don’t do something fast, it’ll be too late! Aelita: Think we can use the scanners to separate them again? Jeremy: I think we can. We have to send him – uh, them – back to Lyoko. Yumi: Better count me out, I’ve still got that leech on my tail! Jeremy: No, I know what to do. As soon as I get to the factory, I’ll call you back. Jeremy: Come on, we’ve wasted enough time. Let’s go! Odd: What? But can’t we eat before we go? Ulrich: Wanna eat dog food all of your life? Ulrich: You know those guys? Jeremy: Uninvited visitors who used the factory for a practice track! Ulrich: What do we do about those guys? Jeremy: We’ll worry about them later on. Right now we gotta take care of Odd! Ulrich: Nice, the locals came to welcome us. How about a little Overbike action? Jeremy: You got it! Be careful. Ulrich: Relax, I won’t run any red lights of anything! Jeremy: Major trouble on Lyoko, better get over here! Yumi (watching Sissi): Hm…I get the feeling you forgot about Sissi! Jeremy: No problem. Give me a minute, then double-time it over here! Jeremy (with the voice synthesiser): Elisabeth, why aren’t you home yet? You should be in your room doing your homework! Do you understand? Now then, hurry on home! Yumi: She’s finally outta my hair! Well, you know the way back! Ciao! Yumi: Jeremy, why isn’t the elevator working? Jeremy: I shut it off because of those three goons. Are they gone? Yumi: What three goons? There’s nobody up here! Jeremy: I’ll explain later. No sign of XANA trouble in town? Jeremy: Good. I’ll switch on the elevator right now. See you in a sec! Ulrich (after destroying a Tarantula): Jeremy, I think I just hit a pedestrian! Jeremy: Ulrich! Yumi’s not answering! Something’s not right. Ulrich: Ok, I’m on it! Odd: It’s about time, my paws are really killing me! And these guys won’t let sleeping dogs lie! Jeremy: Odd, I’m not done yet! It’s too dangerous! Do you hear me, Odd?! Oh…you’re about as obedient as Kiwi! Jeremy: Odd, no! The DNA data isn’t finished yet! Odd! XANA-William (seeing Aelita enter the tower): No! Bearded biker: Has he got rabies or what?! Rocky: I dunno, but it’s not worth taking any chances. Let’s roll! Yumi: Hi everyone! Sleep well? Ulrich: No, I didn’t sleep a wink! Odd was so glad to see Kiwi they played all night long! Odd: With Kiwi’s talent and my idea of having him foam at the mouth with toothpaste, you’ve gotta admit that we’re a great team! With the two of us on Lyoko, XANA won’t stand a chance! Jeremy: I wouldn’t try that again! Aelita: By the way Odd, do you always carry toothpaste with you? Odd: Yeah, you never know when you’re gonna run into a pretty girl! Ulrich: His feet smell awful enough, just imagine him with bad breath as well! Yumi: Don’t bother, I know. Yumi: I just broke up with him this morning. Don’t be surprised if he stays messed up for a long time, he took it pretty hard! Odd: You know, I think there’s still a little bit of Kiwi in me. Ulrich: What, you still got a tail? Odd: No! His sense of smell. We’re having beef stew and Brussels sprouts for lunch today. I can smell it from here!